Around €45-50 from independent wine shops – I got mine fro €40 from La Touche in Greystones. Light and elegant, with intense honeyed fruits, a strong mineral streak and a bone dry finish. A mere 12.5% in alcohol, but packed with flavour. Drink with crab or other shellfish. A wine that may seem expensive but I still reckon it is a bargain. The wine pictured beside it, Clos Sainte Hune, a great wine made by the same producer, from a single vineyard, costs well over €100 a bottle if you can find it. Cuvée Frédéric Emile is made from two grand cru vineyards, although it doesn’t say it on the label. 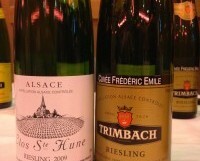 To me, it is one of the great wines of Alsace. 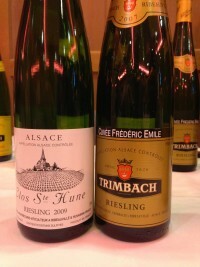 It lasts forever too; I am hoarding the last few bottles of a case of 2002 – a brilliant wine.